← Easy way to Configure and run commands on multiple ESX hosts in the cluster. Removing the VNIC completely from the Windows VM. 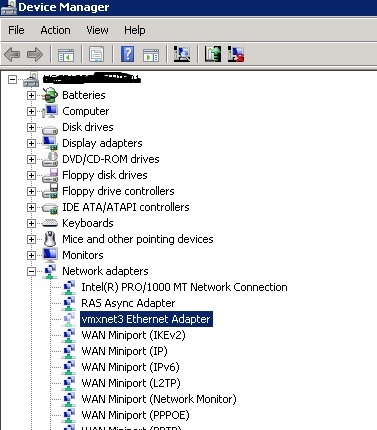 We removed the VNIC E1000 and added a new NIC with VMXNET3 on one of the windows 2008 VM , noticed that windows doesn’t delete the hardware and it just moved as a hidden device. After spending some time , I got the below method to remove the NIC Completely. Make sure to open the device manager using the CMD Prompt. Go to View and Select “Show Hidden Devices”. Select Network Adapters and we can see VM NICs which was removed and it will be grayed out. Reference : JERAMIAH DOOLEY Blog and Microsoft Windows Article . This entry was posted in VMware, Windows and tagged Vnic, Vnic Drivers, Windows 2008 VMs, Windows VM. Bookmark the permalink.